Rei is by far the most mysterious, beautiful, and foul tempered of the senshi, and she likes it that way. Rei is always ready to right in a moment's notice. Rei can get down right possessed by her anger at time. Most would view this as a flaw but in combat as Sailor Mars. She generally likes to be left alone due to her father's abuse as a child and his absence in her current state. The Senshi are the only one's she feels she can trust, Mina especially. Rei is extremely involved in the spirit world, spells, magick, and superstitions. Her religion is placed in battles through her fire attacks. This makes her extremely mysterious and generally drives people away. Rei does like to keep to herself but is kind to strangers nevertheless. Meditation, drawing tarot cards, and prayer are a constant part of her life, she seeks them to guide her and is not afriad if it ends badly. Rei's faith is mostly driven through her up bringing at the Sendai Hill Shrine. Her grandfather owns and opperates the shrine and she has studied her faith so intensly that she's now a priestess. She hopes one day, after her grandfather is gone, to run the temple as High Priestess. Rei's closest friends are Mina and Kotono(a girl that knows she's Mars). Rei also keeps two pet crows, Phobos and Deimos, who she values more as friends, seeing that they guide her, than possessions. Rei values Mina more as her favorite friend because Mina seems to be the opposite her, and we all know that opposites attract. Mina and Rei both know the importance of protecting Serena and even give their lives to keep her safe. Sailor Mars is the second Senshi to be discovered by Sailor Moon. She accepts her mission with intital reluctance but after discovering her true identity she seems to accepts it with open arms. She always maintains that she'll become head priestess but knows she will wind up on Serena's court. Sailor Mars' attacks are in tune with fire and archery. 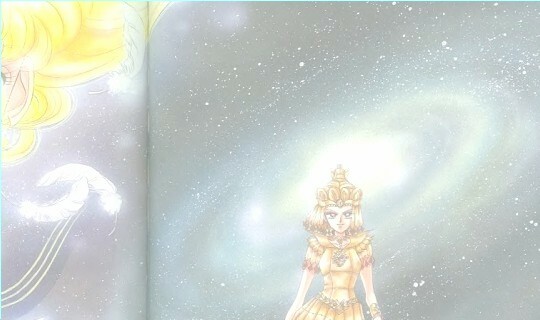 Her attacks are second in power to Serena's in the Inner Senshi. Mars' ESP helps her long attacks hit a persice target. Phobos and Deimos also become Sailor Mars' eyes in reaching targets that would be nearly impossible to hit under the nomal circumstances of battle.